The Jones Library System needs MORE Friends! 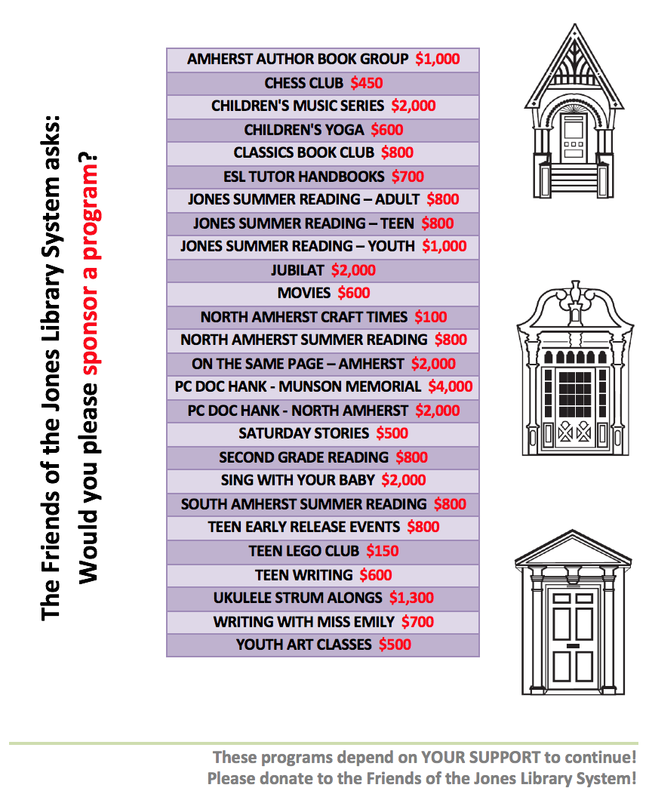 Now is the perfect time to join or renew your membership in the Friends of the Jones Library System and support Amherst's three Town Libraries. Friends donations benefit the entire community and make possible the following: new materials and books ($18,000); diverse workshops and programs such as Chess Club, art series, Community Sing, Sing With Your Baby ($3800); jubilat/Jones poetry series, bringing nationally recognized poets to Amherst ($2150); and various museum passes ($1685). We hosted a retirement party for the community to celebrate the work of outgoing Jones Library Director Bonnie Isman. Members of the Friends also participated in the search this summer for a new Director of the Jones Library. And the Friends supplied hospitality with edible treats for the Emily Dickinson Museum’s “Emily Dickinson Big Read” series held at the Jones. The Friends have been working hard to honor the gift of Richard and Nathalie Woodbury. As a first step, a “Woodbury Room” committee has proposed refurbishing and renaming the library’s Large Meeting Room and we hope to get project approval from the Trustees soon. We Need Your Financial Support. There is no doubt that 2012 will be a challenging fiscal year once more for many Amherst residents as well as for our libraries. A gift to the Friends of the Jones is a gift that makes Amherst a better place in so many ways. Click here for a Friends membership form and send in your contribution today. Thank You!